We stayed for two nights here & everyone was very friendly. We were able to give them our laundry before 12pm & it was ready by 7pm. Very quick & fresh! It was clean & location was also very good. The hostel is very close to everything you need, from the bus station leading to the airport, to a bus stop and pathways to the subway. 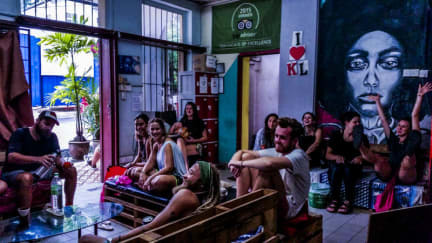 The workers are diverse and quite knowledgeable about Kuala Lumpur and are more than just workers, but also friends that leave an impression on you. Add to it the included breakfast, filtered water, and exclusive deal to eat at an Indian restaurant for a cheaper price and the Step Inn Guest House holds real value for your money and I highly recommend it! Our stay here was a very nice and relaxed time. We booked a private room and it was clean, only thing was the AC wasn’t working too well. Staff was friendly and inviting and willing to help. Common space was nice, big flatscreen TV, foosball table, smoking area, coffee and tea all day long. WiFi was pretty good and they had reasonably priced beers. Overall was a great stay, if you’re looking for a cheap place to sleep, would totally recommend! Friendly and very helpful staff, Hostel is conveniently located in the city centre. Facilities were good, showers, toilets and rooms in good condition. Price was amazing really, no complaints. Recently stayed at step inn for four nights while doing a visa run in Kuala Lumpur. Rooms are very basic. 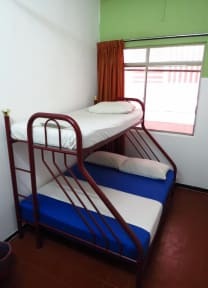 We booked a nicer double room but it was dark and smelled musty but for $48 this is about as cheap as you will find a place in KL. If you want nicer you will have to spend more. I will say that the staff are nice, they provide toast in the mornings, tea and coffee all day and there is a lovely outdoor seating area where you can relax. I’d recommend if you’re not fussy and on a budget. Security, location and staff is ok, but the building and facilities are old. No music, no atmosphere. Uncomfortable beds. Because doors and windows are open all the time in every floor, reception / Lobby and kitchen, it makes the hostel incredibly hot and opens the field for different types of mosquitos which eat you alive. I asked a couple of the staff members what to do for the mosquitos. They both laughed without offering any help. I left sick from the bites with a very unpleasant feeling.